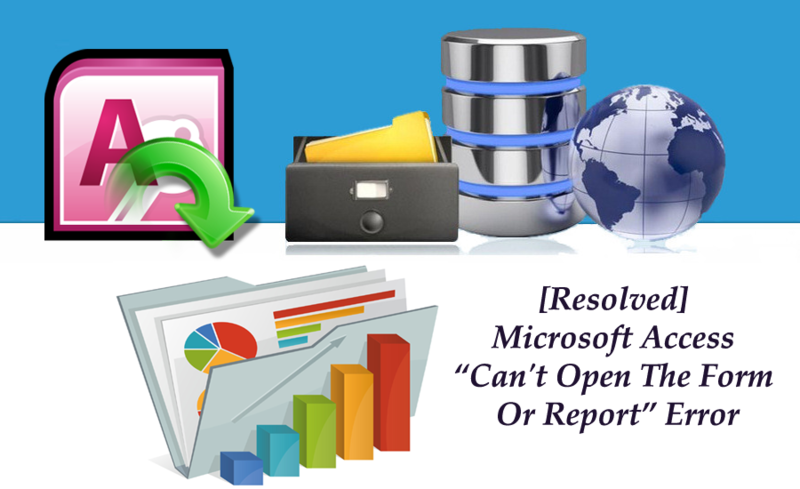 Is your Access Database is denying to open up your saved form or report Or getting Microsoft Access can’t open the form issue? Well, if you too are victim of this then try theses mentioned fixes to resolve this “can’t open form or report “error in Access. Well many users like you rendering the same issue in their respective Access Database application. Here is the scenario of one such user who is dealing with this “Microsoft Access can’t open the form it contains data that Microsoft access doesn’t recognize” error. I was in the process of editing a complex form in Access 2013. At one point, when I closed the form (in design view) and tried to open it in form view, I got an error that access cannot complete the operation because there is not enough memory. I know that the problem is not my computer, because I am able to open the database on another computer (with Access 2010), and when I try to open that form, or export it, or anything, I get the same memory error. This form would take hours, if not days, to recreate. Is there anything I can do? Thanks! You might also be facing not exactly but similar kind of issue, so it’s important to know the fixes to resolve them as soon as possible. Take some important initiative before the complete of your data get reached to a state from where the recovery is almost impossible. So before stepping to the resolution for fixing” Can’t Open Form Or Report “error in Access. Let’s start with the little info on Microsoft Access fundamental objects i.e form and report. Form is one such Access database objects that makes the data available on the screen. With a form, you can view and edit the data like sorting, deleting, appending and so on. Form actually let you work with your data. It does’ store any data; it’s just a tool for viewing the data in your table. Any modification done in the form will reflect in the table. The another Access Database Object is report. Well this object, is to display your data but on paper. Unlike Form, Reports won’t allow you to edit the data as they are designed to static. Once you have printed your data on paper it’s going to be pretty static, so it means reports reflects that. When you make a form or report and apply a filter before saving it for the very first time and save it when the filter is still in effect, the filter can’t be turned off the form or report always display the filtered view of the underlying table or query. Though it’s, a new feature to easily create permanently filtered forms and reports. 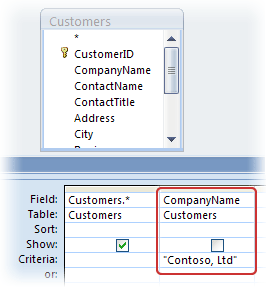 MS Access does this incorporating filter into the object’s design, if the filter is working when the object is first saved. If you don’t want a filter that you have used to a newly created form or report to be their permanently; then it’s better to remove the filter before you save the objects for the first time. From the navigation panel, make a right click over the form or report and then click the Design View present on the shortcut menu. The object will get open in Design View. If you are unable to see the property sheet then press f4 to display it. Tap to the object’s record source property box and then hit this The query designer appears with the object’s recordset query displayed. For the filtered fields and filter criteria, look in the query design grid. In the shown figure, there is one filtered field CompanyName, and a single criterion, Contoso, Ltd. In order to remove the filtered field and its criterion, just press the DELETE option. Similarly, for each filtered field which you want to delete from the object’s design, repeat step 5 and 6. Close the query designer, as soon as you are prompted to save the change made to the SQL statement and update the property, click Yes. By doing theses aforementioned steps you must have successfully removed the permanent filter from your form or report. While creating form, reports and the code in their modules, there are many chances for them to get corrupt. To work around this, import other objects into a new database. Select for a Blank Access Database and click OK.
Now click on the File menu, go to Get External Data and select Import. If in case you don’t receive any import object window than this process can’t recover your access database otherwise, continue. Click to the Tables tab at the top of the Import Object Window and click Select All. Do the same thing for other 6 tabs also in the window. At last click the OK button when done. After completing all these, the data from corrupted database should now be in the files that you have just created. Removing permanent filter from any form or report doesn’t preclude you from using the same filter in a form fashion on this object in the future. It only deletes it from the object’s design so that you can view all the records in its underlying table or query by default. Now you can flawlessly work with your Access Database Form And Reports. If you find this post helpful then share your opinion in our comment section. You can also discuss if you are been facing any other issue too.